It takes a level of maturity to be a productive member within an effective team environment. Some people have not reached that level of personal maturity. Yet. Let’s play a little game. It’s called The Spectrum Game. If ‘white’ is at one end of the spectrum, what’s at the other end? Well done. It’s ‘black’ – not a trick question. Let’s play again. Think about a person. If ‘dependent’ is at one end of the spectrum, what’s at the other end? Wrong I’m afraid. That was a trick question. ‘Independence’ is not at the opposite end of ‘dependence’ on a spectrum. 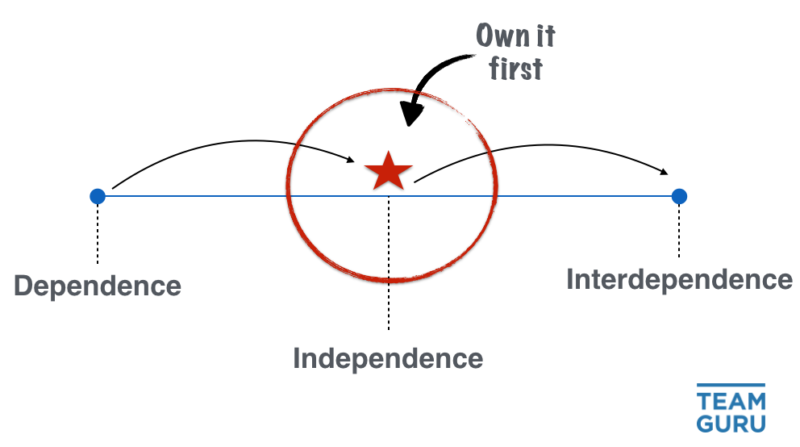 On a spectrum that has dependent at one end, independence belongs in the middle. It’s a transition phase. Like grey is on the black-white spectrum. So what is at the other end of that spectrum? It is of course ‘interdependence’. The Dependent – Independent – Interdependent spectrum describes the journey of Personal Maturity. Think about a child – new born. They are completely dependent on their parents for every aspect of their survival. As that child grows and learns new skills, they move along the spectrum. They will be dependent for many years – but they steadily move towards that halfway point, independence. During those important, formative years, that middle destination is our goal. We are determined to find our own feet in life – to enjoy the freedoms that come with losing dependence on our parents and gaining a level of independence. During this period, as we peruse independence, we start making our own money, learn how to drive, get our first car, move out of home. The quest for independence was so alluring, so vital to our growth, that it’s little wonder some people mistake it for the final destination. But independence is not the final destination. Interdependence is the ultimate goal. Interdependence takes courage. It means relying on others and being relied upon. It means being vulnerable with them, and being strong for them. It means contributing what you can, and taking from them what they contribute. Trust is the very air that is breathed within an interdependent relationship. Sometimes teams are interdependent. And sometimes marriages and family units are too. Sometimes teams are made up of a collection of independent people, who hang a sign on the door that reads ‘Team’. Sometimes a married couple does the same thing. We can all recognise in our private and social life people who have mastered independence, but are unable to take the step to interdependence. We can also think of people we know who tried to move from one end of the spectrum to the other, without mastering the middle. They skipped independence. They went straight from dependent – probably on their parents – and attempted interdependence, perhaps with a spouse. This is not possible – what they did, in reality, was swap one dependent relationship for another. You cannot make it from one end of the spectrum to the other without first conquering the middle. One must master independence before moving to interdependence. The trick is to avoid getting stuck there. So what does this mean in a professional setting? Just as we can identify people in our private life who are either stuck in the middle, or tried to skip over the middle completely, we see it in our professional life too. There are roles for people in a professional setting who fiercely protect their independence – but they can often prove to be a stumbling block in an effective team environment. A team is by its very nature an interdependent beast – a web of communication, cooperation, giving and taking. Individuals who cannot offer themselves completely to a team dynamic may come from a considered position of individual values. Or, they may simply be stuck halfway along the personal maturity continuum. 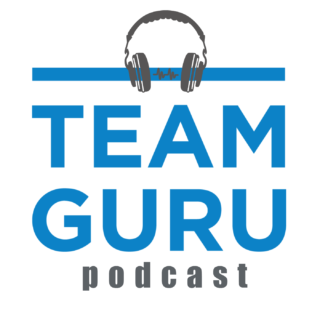 Listen as I talk about the interdependent nature of teams, personal maturity and much more with team expert Chris Burton.